Each Asian inspired motif looks as if the graceful bird has taken flight against a setting sun. 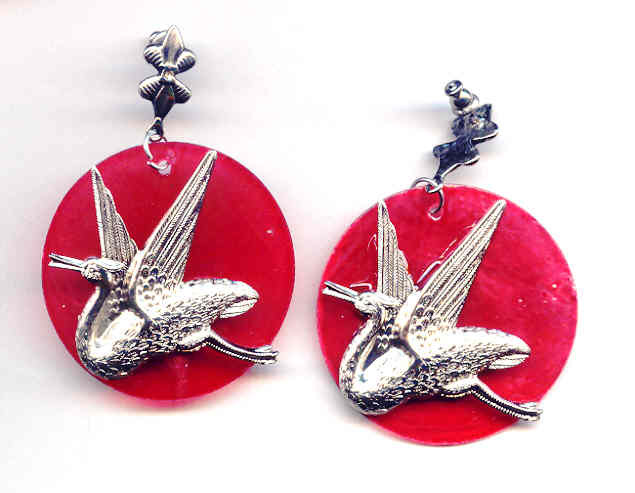 I've suspended these beauties from silver tone findings with hypo-allergenic surgical steel posts. Such super-sized light weight earrings are all the fashion now, so here's another fashion forward pair from SPARKLE PLENTY. In these charming summer earrings I've used crimson 20mm and plum 13mm capiz shell discs.